The intense summer rays of sunshine may be a distant memory, but that doesn’t mean that we should pack away the SPF. In fact, SPF is helpful throughout the year for protecting your skin. 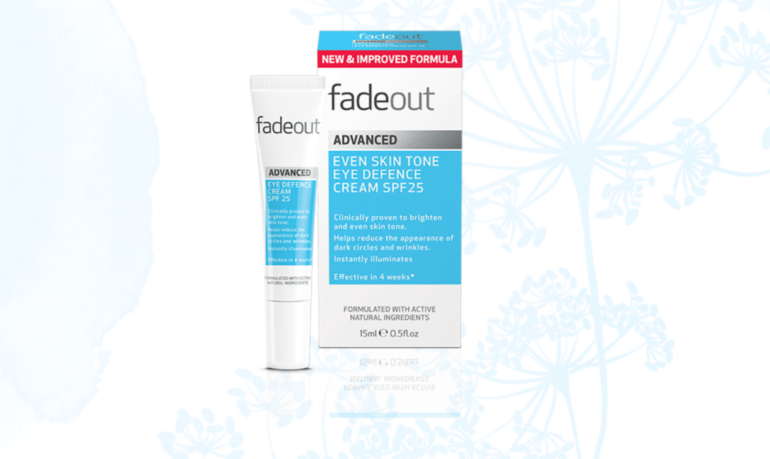 The new Fade Out Advanced Even Skin Tone Eye Defence Cream contains SPF 25 and it brings lots of benefits in addition to ensuring your complexion is protected from the sun. The Hyaluronic Acid in the cream helps to retain moisture, which can be a challenge as the weather turns. Niacinamide is a naturally occurring Vitamin B3 that also works wonders and helps to even skin tone by reducing the production of melanin. This cream is a handy purchase for the winter months and is a bargain beauty buy at under £10. It contains naturally active ingredients that help to illuminate your skin and reduce the appearance of fine lines, wrinkles and dark circles. The product is light and delicate to apply. It doesn’t leave your skin feeling greasy and is absorbed quickly. Is is best used over a period of four weeks for maximum results.